To live in harmony with oneself and the environment is the wish of every human. However, in modern times greater physical and emotional demands are constantly placed upon many areas of life. The result: more and more people suffer from physical and mental tension such as stress, anxiety, insomnia, and there is an imbalance in physical activity and proper exercise. This is why methods and techniques for the attainment and improvement of health, as well as physical, mental and spiritual harmony, are of great importance. 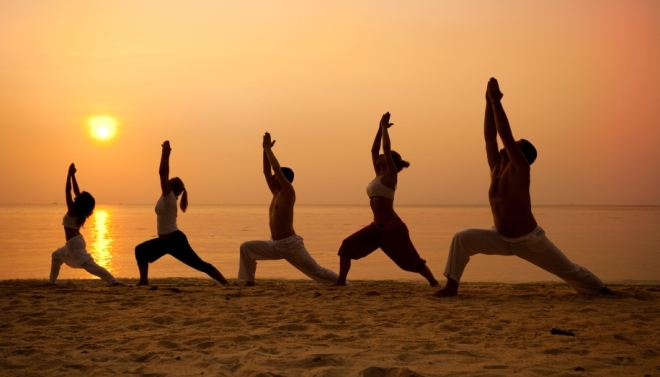 The word “Yoga” originates from Sanskrit and means “to join, to unite”. Yoga exercises have a holistic effect and bring body, mind, consciousness and soul into balance. In this way Yoga assists us in coping with everyday demands, problems and worries. Yoga helps to develop a greater understanding of our self, the purpose of life and our relationship to God. On the spiritual path, Yoga leads us to supreme knowledge and eternal bliss in the union of the individual Self with the universal Self. Yoga is that supreme, cosmic principle. It is the light of life, the universal creative consciousness that is always awake and never sleeps; that always was, always is, and always will be. Many thousands of years ago in India, Rishis (wise men and saints) explored nature and the cosmos in their meditations. They discovered the laws of the material and spiritual realms and gained an insight into the connections within the universe. They investigated the cosmic laws, the laws of nature and the elements, life on earth and the powers and energies at work in the universe – both in the external world as well as on a spiritual level. The unity of matter and energy, the origin of the universe and the effects of the elementary powers have been described and explained in the Vedas. Much of this knowledge has been rediscovered and confirmed by modern science. From these experiences and insights a far-reaching and comprehensive system known as Yoga originated and gave valuable, practical instructions for the body, breath, concentration, relaxation and meditation. The system “Yoga” is taught worldwide in Yoga Centers, Adult Education Centers, Health Institutions, Fitness and Sports Clubs, Rehabilitation Centers and Health Resorts. It is suitable for all age groups. The exercise levels were worked out in consultation with doctors and physiotherapists and can therefore – with observation of the stated rules and precautions – be practiced independently at home by anyone. “Yoga” is a holistic system, which means it takes into consideration not only the physical, but also the mental and spiritual aspects. Positive thinking, perseverance, discipline, orientation towards the Supreme, prayer as well as kindness and understanding, form the way to Self-Knowledge and Self-Realization. The health of the body is of fundamental importance in life. As the Swiss-born Physician, Paracelsus, very correctly said: “Health is not everything, but without health everything is nothing”. To preserve and restore health there are physical exercises (Asanas), breath exercises (Pranayama) and relaxation techniques. An even greater factor in the maintenance of good health is the food we eat. What we eat influences both our body and psyche – our habits and qualities. In short, the food we eat has an effect upon our whole being. Food is the source of our physical energy and vitality. Balanced and healthy foods include: grains, vegetables, pulses, fruit, nuts, milk and milk products, as well as honey, sprouts, salads, seeds, herbs and spices – either raw or freshly cooked. Foods to be avoided are old, reheated or denatured foods, meat (including all meat products and fish) and eggs. It is also best to avoid alcohol, nicotine and drugs as these rapidly destroy our health. In general, we are led through life by the mind and senses, rather than having these under our control. However, to gain control of the mind, we must first place it under inner analysis and purify it. Negative thoughts and fears create an imbalance in our nervous system and through this our physical function. This is the cause of many illnesses and sorrows. Clarity of thought, inner freedom, contentment and a healthy self confidence, are the basis for mental wellbeing. That is why we strive to gradually overcome our negative qualities and thoughts and aim to develop positive thoughts and behaviour. “Yoga” offers numerous methods to attain mental wellbeing: Mantra practice, the observance of ethical principles, the keeping of good company and the study of inspiring texts to purify and free the mind. An important tool in self-investigation and self-knowledge is the technique of “Self-Inquiry Meditation”, a step-by-step meditation technique of Self-Analysis. In this meditation practice we come into contact with our subconscious, the source of our desires, complexes, behavioural patterns and prejudices. The practice guides us to become acquainted with our own nature – as we are and why we are so – and then beyond self-acceptance to Self-Realisation. This technique enables us to overcome negative qualities and habits and helps us to better manage life’s problems. Social health is the ability to be happy within oneself and to be able to make others happy. It means to nurture genuine contact and communication with other people, to assume responsibility within society and to work for the community. Social health is also the ability to relax and experience life in all its beauty. One of the growing problems of our times is drug addiction. It is a clear sign of social illness. The system of “Yoga” can assist in overcoming this illness and grant people a new, positive aim and purpose in life. The importance of keeping good, positive company has a great influence upon our psyche, as such companionship moulds and forms our personality and character. Positive company is of great importance in spiritual development. Living “Yoga” means to work for ourselves and for the benefit of others. To do valuable and constructive work for our neighbours and the community, to preserve nature and the environment and work for peace in the world. To practice Yoga means to be active in the most positive sense and to work for the welfare of all of mankind. This precept embraces the principle of non-violence, in thought, word, feeling and action. Prayer, meditation, Mantra, positive thinking and tolerance, lead to spiritual health. Humans should be protectors, not destroyers. Those qualities that really make us human are the ability to give, understand and forgive. To protect life and respect the individuality and independence of all forms of life is a primary practice of the Yoga teachings. By following this precept greater tolerance, understanding, mutual love, help and compassion develops – not only between individuals, but between all humans, nations, races, and religious faiths. A fundamental principle of “Yoga” is religious freedom. Yoga is not a religion – it is the source of spirituality and wisdom, the root of all religions. Yoga transcends religious boundaries and reveals the way to unity. “Yoga” offers the spiritual aspirant guidance on life’s path through the practices of Mantra Yoga and Kriya Yoga. As the most highly developed beings upon earth, humans are capable of realising their real nature and inner Self, God. The spiritual goal of Yoga is God-Realization, the union of the individual soul with God. The realization that we are all one in our common root and connection to God is the first step. Decisions regarding your health and well being and a free, happy life, are in your hands. Practice regularly with firm determination and success will be certain. I wish all Yoga practitioners and those still to become practitioners much happiness, success, health, harmony, joy in life and God’s blessing.